At first glance, „Village“ appears to be just another worker placement game. Far from it! We are faced with new and surprising possibilities to gain victory points. Be it be aiming for a quick demise of one’s family members thereby entering the village chronicle and speeding up the game or by a more careful time management slowing down the game by travelling. Whatever strategy we choose, each game turn is short with little downtime for the other players. 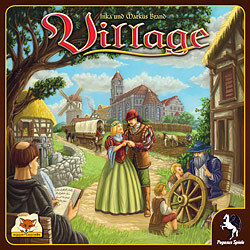 Despite its many options “Village” is a light and fun game - a highlight of the current gaming year!